Zoltán Tamássi (1912-1997) was an important poster artist and graphic designer. In 1945 Tamássi was one of the leading graphic artists who renewed the visual language of the political poster in Hungary. He designed election campaign posters for opposite parties, like the Peasants’ Party, the Social Democratic Party and the Hungarian Communist Party. Tamássi was initially the propagandist of the Peasants’ Party, but he was commissioned by other political parties as well. The art for this deck was rendered in tempura. 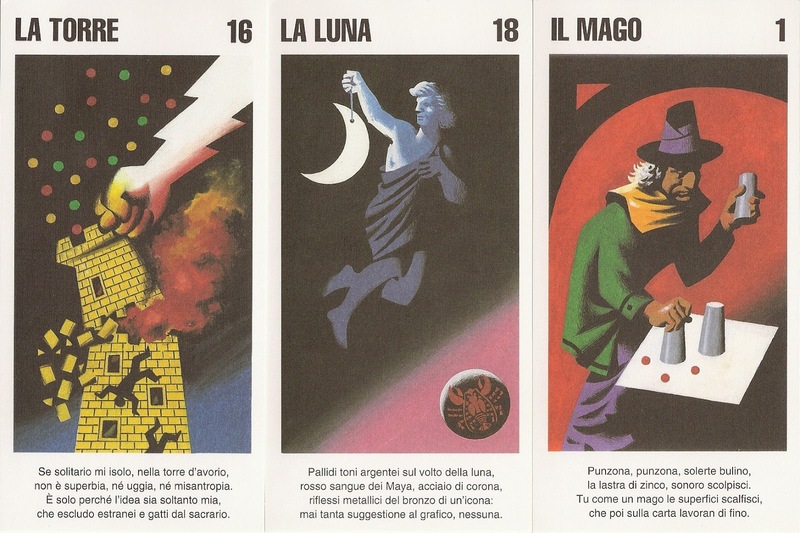 Each card is titled in Italian and includes a poem by Gianni Brunoro. The reversable red and white back design shows a hand surrounded by the alphabet.